For past few months, I am travelling a lot, from one city to another, so much so that, I am not able to sleep and dine properly for one day. But it’s okay. It’s new kind of feeling, and I am enjoying it. There is a popular saying, with travel comes new experiences, and I believe, it is pretty much right. I also have one such experience that has changed a lot in me. It made me realize, life is not what you order, it is more than that. It was dark almost, and I thought to have dinner only when I will reach home. It was hardly 40 kilometers and it is okay to starve a little. But out of sudden, it started raining, and I need to take shelter. The place where I took shelter turns out to be a restaurant, and I thought why don’t eat here. Least, this is what Indra is hinting. I asked for a table, and waiter showed me the way. There was a family sitting on the left most corner and a group two tables after them. My table was also in the corner, but in the right half. It took me a minute or two to figure out, and I ordered a half plate shahi chicken and chapattis. It took waiter almost twenty minute or so to setup my table. I was starving like hell at that point of time. So I didn’t ask, what took him so long, I just took the chapattis and open the handi lid to get some chicken on my plate. But to my surprise, it was not shahi chicken, it was kadhai chicken, and it got me started. So I agreed and took my first bite. It was boom, a blast of flavours, in my mouth. The dish was not bad at all, rather it was the best thing I have tasted. He was right when he said, “Life is not what you order, sometimes you need to try some new dishes.” I believe this is how you find new flavors of life, by trying out. And it’s lottery when you need to pay only half the price. The waiter should have informed you about the "problem" in the kitchen before bringing you the kadhai chicken. We went to a Mexican restaurant. My wife and I ordered Enchilada with Rice and Beans. When the food came, there was salad in lieu of beans. The waiter said they ran out beans. (Unbelievable. It is like a restaurant in Chennai running out of idli during breakfast.) I told the waiter he should have informed us of the change in what we ordered before he brought the food. We left the restaurant. Pretty right. 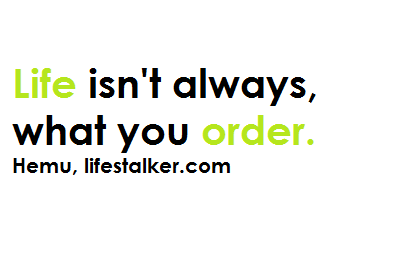 Life really isn't always what we order. It sometimes gives better than we deserve and sometimes otherwise. But its worth it, isnt it? ?